This is the second topic in our current series, “Overcoming Hardship.” The first discouraged believers from doing just about anything, including illegal and wicked stuff, to get by and get rich because things are hard. You can click on the title below to read that post if you missed it to set the stage for this one. “Come and register under me,” became a chant. When I learnt what was taking my students’ time and money, I quickly began to dissuade them from participating. I devoted lecture hours to preach against these schemes. I was amazed that many thought the schemes were new results of the inventiveness of bright minds to help people cope with the ailing economy. They shuddered when I told them they were scams and have been around for long; that newer ones just announce juicier terms to undercut their competitors. Thankfully, many refrained from “investing” their school fees and allowances in the schemes, but others ignored my counsel. Shortly after, the unsustainable returns promised could not be paid and some of the schemes crashed. Some students whose money was trapped had to sell their laptops and other valuables to pay their fees. But these schemes are proliferating and they are being patronised by believers and churches, hence this post. A few weeks ago, a young man who is an evangelist was overheard having a one-sided vitriolic conversation with someone on the phone. The location was a cyber café and the evangelist was heaping curses on the guy on the other end. He declared that the fellow would lose everything and suffer all manner of afflictions for duping him. What gave rise to this rain of curses? The evangelist had got involved in a Ponzi scheme and was matched to be paid by the fellow he was cursing. On the said day, the guy assured him he had paid but network issues at the bank were hindering the deposit from reflecting in the evangelist’s account. He sounded like a responsible person and the evangelist confirmed on the platform that he had been paid, only to find out later that no deposit had been made. I wonder what he hoped to accomplish with the curses, perhaps to scare the guy into paying up. But that wasn’t going to happen ’cause the only thing the young man replied was, “If actually you’re a man of God, what are you doing on this type of platform?” Personally, I find that a most pertinent question and hereby rephrase it: Child of God, what are you doing on a Ponzi scheme? 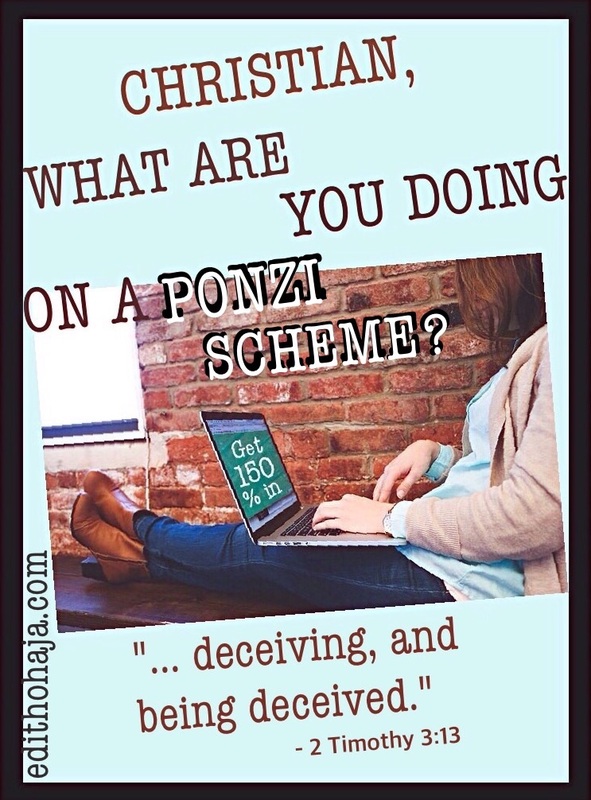 What is a Ponzi scheme? This explanation is necessary because some may really not know the true nature of some of this stuff that they have dabbled into and erroneously believe they are “manna from heaven.” Before we see a couple of definitions, I want to point out that network marketing, which adopts a pyramid scheme as Ponzi schemes do, is quite different and legitimate. In that case, there are tangible products sold from which the marketers get their commissions and promotion on the pyramid is based on the extent of sales and recruitment of new marketers. Here’s a quotation from the Wex Legal Dictionary/Encyclopedia of the Legal Information Institute, Cornell University Law School. It gives both the meaning and mode of operation of Ponzi schemes. So my question once again is: Christian, what are you doing on a Ponzi scheme? Does any of the foregoing sound like God’s way of providing for or prospering His own? Are you sure you are unaware that these schemes are swindles? Or have you chosen to persist in them regardless? The Bible has some words for those with a get-rich-quick mindset and you can be sure they are not words of commendation. In an article posted on Dec. 16, 2016, Premium Times listed the 7 trending Ponzi schemes in Nigeria then as MMM Nigeria, Ultimate Cycler, Zar fund, Givers Forum, Icharity, Crowd Rising and Get Help Worldwide. There are many more of such schemes both here and in other countries of the world with new ones springing up everyday as those who were “burned” in other schemes or just plain greedy folks set up shop to defraud unsuspecting members of the public. There’s even one called NNN Nigeria that has started growing with the tanking of MMM Nigeria. Their names alone should tell you these are copycat schemes but essentially running a pyramid swindle. Mutual aid, my foot! If you feel I’m being a fusspot, take a few minutes to research these schemes. You will find out that they should not be the gospel of the hour as unfortunately they have become for some. It is scandalous to hear of engagement in Ponzi schemes being taught in churches. It is a sign of gross ignorance of both financial management and the word of God. As we pointed out in the first teaching in this series, “Christian, Flee ‘Whatever It Takes To Survive’!“, the Bible does not say we should obey God when things are rosy but follow the world in its ways when things are tough. Our God is able to sustain and even prosper us in the hard times, in His own way. 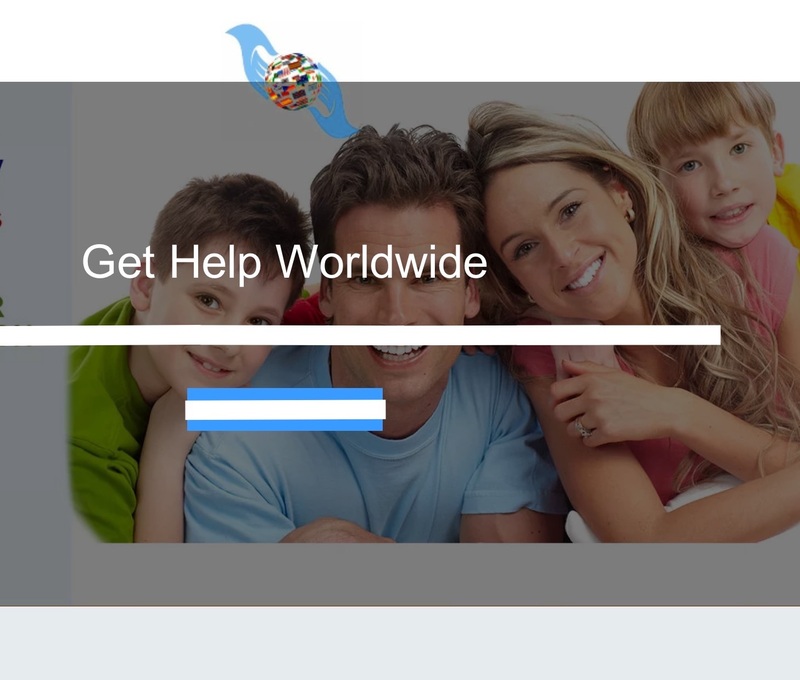 Don’t be taken in by the classy-looking web sites and beautiful models used. It doesn’t matter the “testimony” of returns anyone gives you. It does not make this wrong thing right. Get out immediately if you’re on one and seek ways to make restitution for your involvement. Trust in God and get involved in legitimate businesses. The dividends may not be fabulous at first but as you faithfully build, God will reward your efforts by His mighty power. Remember, if anything, including a business opportunity, seems too good to be true, it probably is! This series continues soon with a teaching on specific dangers Ponzi schemes pose to believers. Very informative. I love the fact that you pointed out churches being involved. Did some of us forget, Jesus, drove out the money changers! Wow. How can someone of faith actually believe that money not worked for could be a gain. SMH! My sister, it really beats me! May the Lord have mercy on His children in Jesus' name. Very informative Edith. Thank you for taking the time to gather this info! Thanks a whole lot, April. I pray that people don't keep putting their hopes and money into these scams. You are highly blessed in Jesus'name. New schemes come out on a daily basis with lots of people rushing to 'invest' in them. Whatever happened to opening small businesses based on skills and talents? It pains me because people lose a lot in all these, money that could have been used in doing something tangible. I once advised a friend to sow a seed in church instead of in a ponzi scheme and her reply baffled me. She said she needed sharp sharp cash as often times it takes years for a seed in the house of God to materialise. God help us ooooh! Amen, my dear! We really need His mercy. But people seem to love lies, rather than the truth. Thanks a lot, Ifeanyi! You are highly blessed in Jesus' name. Amen. And it shall be well with us in Jesus' name. Everyday we learn with horror how Nigerians participate in these schemes, especially among students and the youth, though the employed are not left out. Sometimes I query their sense of judgement and conscience, but I blame the Government all the same. Maybe if they did enough to improve the economy, provide jobs with maximum salary, reduce price volatility on the part of good and services rendered, carry out a concerted online censorship and crackdown on ponzi sites, and generally fight corruption- maybe- the situation would have been better. I've learnt something about people being desperate. That is the case with many who participate in this. Desperate to be rich quick, Desperate to feed a hungry, frustrated belly, Desperate to evade the harsh conditions of the economy, Desperate to survive at all cost. I believe that if all these desperations and more are well analysed, addressed through solution provision, people would have no time becoming patronizers to Ponzi. Nice one Ma. Thanks a lot for your well-thought out response, Ekene. But my worry is that the regular media sometimes feature the Ponzi schemes with their fabulous claims and exolain how one can get on board in articles written by their own staff, perhaps because the wind of public opinion is in favour of the schemes. Maybe that is changing slightly now but social responsibility dictates that the media educate the people and not give them what they want always. Be richly blessed of the Lord, Ekene! Thank you for this piece. I think if more people publish this kind of piece more often, people wil, to a great extent, refrain from ponzi. Too many young people are financial trouble now because of ponzi while few have more money made from these fraudulent schemes. Remain Blessed Aunty Edith. I just learnt something new from this article. I never knew the origin of ponzi scheme until now "Named after Charles Ponzi (1882-1949), an Italian immigrant to the US who, during 1919-1920 collected more than fifteen million dollars from some 40,000 eager people by promising to double their investment in 90 days.” I am not and will never be a supporter of this ponzi scheme. 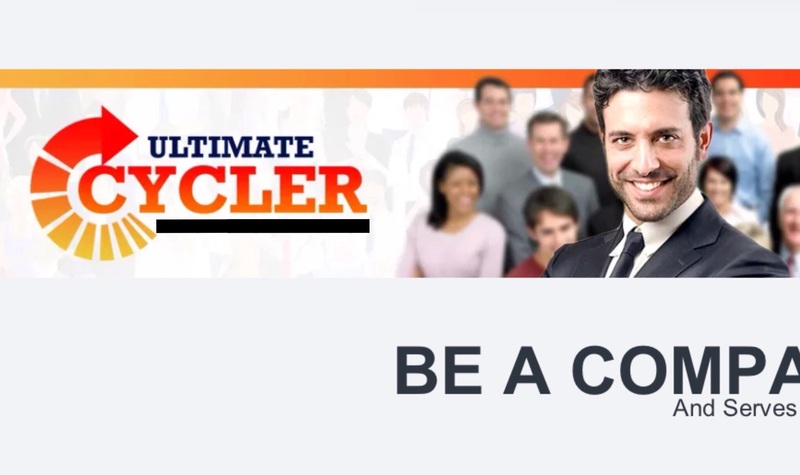 I remember sometime last year, a very good friend of mine sent me a message telling me about this Ultimate Cycler. I was convinced beyond every reasonable doubt but when I asked God if I should go ahead, he showed me the repercussions via a dream. I saw myself in a state of uttermost confusion, doing unimaginable things just for money. I woke up, called my friend to reveal the experience I had. From that morning, I lost interest in ponzi scheme and will never ever gain interest in it. Besides, where are people's integrity this days? A complete stranger would walk up to you, not to preach about Christ but about a ponzi scheme. How appalling! Lord, restore the dignity of man! Wow! I'm excited that you actually hear from God. Many believers are walking blindly, depending on human understanding (theirs and their friends). That's why they are unable to distinguish truth from falsehood and make so many mistakes. Thank you so very much for sharing this. I believe it will bless others tremendously. Bless you, Ononso! By God's grace, we'll adduce more reasons why it is dangerous for Christians in the next post. If you ask MTN, they would probably tell you it's the handwork of merchandisers, not their office directly. But they contracted with the merchandisers to use the network to contact their subscribers. Should they not stipulate that these merchandisers stick to ethical and legal communications? We need a government, my dear, and efficient regulatory authorities. Very expository! When almost everyone started saying, "come and register under me", I tried talking some out of it. But I must admit I failed much more than I succeeded. Probably if I'd been armed with this, I would have done better. Thank you so much for this. Praise God and by His grace, the next post will provide more concrete ammunition for you. Keep shining your light, my dear, in Jesus' name. Hard work pays ,it really does. Though not as fast as we desire but the end with our diligence pays more! Creativity is really dying off and cheating others to satisfy ones need for money is what ponzi schemes are all out for. We as Christians are called out to be different. Let's not forget that. This work is indeed a revelation ! Glory to God! May God help us to do right always and represent Him well even when the whole world is going astray in Jesus' name. MA, honestly I was a victim of this o. And it happened because I refused listening to the Spirit of God which reckoned with my spirit not to indulge in such. I felt the errorneous aspect of it o, but at a point I was really carried away. I thought its legal simply because I heard and saw some strong believers being involved. Honestly speaking, ponzi scheme is not for a believer. Believers please, let's all flee from quick money making businesses! Well done aunty, more grace for higher inspiration on matters like this. Amen to that prayer. May God help us to discern between truth and falsehood. May He also help us not to love lies because they are sweet and hate truth because it is often bitter. Thank you for your openness and the admonition. very informative and educating, God bless you. Thanks a lot, Iheanyi, and remain blessed! Amen. And may God bless you more, my dear! Ponzi schemes have really killed creativity and productivity especially in the youths. Nobody cares about doing things the right way anymore they just go ahead and seek easier means of making money and if you notice the same way this money comes is the way it goes as well, because it's still the same money circulating. One of my friends almost missed her exams becuse of one, she left the venue for her exam to come back to the hostel saying her money is hanging. Now I begin to think of how such a person will calm down and articulate during the exam. I won't deny I did it once and that once was not a good experience cus it leads to depression and an uncalm mind knowing that ur money is somewhere with no guarantee of return. Many have died from it, heard the story of a woman who drowned herself after borrowing 400k to do this Ponzi and was scammed. Since she couldn't pay bak and doesn't have the means she was found dead the next morning in the river. Some students will tell u it's a calculated risk... Lol, usng their school fees to do these things. I pity our generation because I don't know where we are headed, the culture of creativity has so dwindled so much that if care is not taken we are going to be building a lazy and hungry generation in the near future. I pray that people will get to see the light and come out of such limiting schemes... Ma this is a nice, informative and expository piece. I learnt a lot from it, even regards the origin of Ponzi scheme and again the Bible passages that speaks against such because some Christians do not know that it is a sin to involve in such things. (I didn't know as well) Thank you very much Ma for taking out time to educate and inform people wisely on this issue, so as to have a lesser straying number. God bless you. This must be the best comment so far, not necessarily for its length but the experiences shared. Thanks for adding much value to our discussion, Vivian! You are awesomely blessed in Jesus' name. It has been a big question whether christians should involved in ponzi schemes, but this article has done justice to this problem. Through this article it is clear that Ponzi schemes should not be the gospel of the day . Christians should be conscious and cautious of the ways of this world's wealth, because their is a way that may seem right in the eyes of man, but the end thereof is destruction. Yes, my dear, some are still debating it. Can you believe that? May God lead us in the path of truth and righteousness in Jesus' name. I could have been a victim if not for the grace of God.this ponzi scheme is just like the gift of Satan,it gives u with the right hand and collects with the left hand. One peculiar thing about this ponzi scheme is that it has a driving force,once u start getting money from it, it becomes very hard to come out.we pray the good lord will help us to invest our money in the right business in Jesus name. A big Amen to that prayer in Jesus' name. Patience and hard work are virtues every Christian should inbibe as they unlock the doors to God's blessings. But impatience and laxity attract God's anger. It is not beneficial to the Christian. The Consequencies of Ponzi schemes is a visible pointer to this fact. For every Christian, it is totally wrong to get immersed in these schemes. I agree: totally, 100% wrong! Chai!!! It is quite clear that most persons have fallen victim of this excercise nd still into it. But this post is now an eye opener to someone like me. I have been in it, it really ate me dry, but glory be to God that I have stopped it and I have no further intention of continuing in it again. Aunt thank u for dis post, remain blessed. May God keep you away from this type of temptation in the future in Jesus' name. Good morning Aunt Edith, I don't know how much this would shock you, but I am a big fan of Ponzi Schemes. I used to hate them until I understood their philosophy. They thrive on peoples greed! It is the greedy that is targeted and it works! How can someone get 80,000 naira from investing two 10,000 'nairas' and go back to invest eight 10,000 'nairas'!!! Ahhh that greed is STRONG!!! My only regret is the naive desperate and vulnerable ones that are also compelled by the greedy lot to join, and who often end up victims in the pyramid. Its so sad! In short, it does more harm than good. You can think of how many suicides have been committed on the basis of some of these crashes. Think of the likes of MMM!!! I heard a parent refused to send pocket money to her daughter for a full semester because she compelled her to put 50,000 in Ultimate cycler almost immediately before it crashed. The mother called the 50,000 naira her semester's pocket money. It's easy to just laugh over it, but we are talking of a girl with no pocket money for a whole semester. That is one way ticket to '7pm mango tree meetings' DAILY! In fact Aunty E. I withdraw my first comment. I am not a fan 'rarara' not to talk of a big fan! Although, there are some claims I do not exactly agree with. But this post is a life saver and very enlightening. I hope my comment was fair enough. Please do not stop doing this, it is an angel touching lives. I love you ma. Bless you, Prince! Which one be 7 p.m. mango tree meetings? Na was oh! Thank you too, Anderline! I'm with you on this! You are highly blessed in Jesus' name. Lol! He suffered the consequences of his evil conduct even while here on earth and God knows where he is now in eternity. Well, it's quite unfortunate because I for one I've lost a lot in these ponzi scheme sites but I just hope I can still recover my losses. How? By "investing" in more of the same? Take Chioma Benjamin's advice and sow a seed in church or give to the poor. When you do the latter, the Bible says that God becomes indebted to you and you can trust Him to pay you in multiples. A very informative piece ma....ponzi schemes are really evil. Wow !!! Lovely writeup ma. This caption is wonderful and should be taken seriously. You made some examples of consequences students suffer after being victims of various Ponzi schemes, I am a witness of a student that couldn't pay his fees just because he foolishly invested his fees into a Ponzi scheme and now he's has been caught in the cross fire because the online course registration has closed. This will haunt such students till the end of their stay in UNN. I think people should read writeups like this especially Christians so that they can distinguish between "manna from heaven" and sin. Love your comment, Uman! It's my prayer that people will shun deception and embrace truth. Shalom! ponzi scheme are like money given to money doubler who u are not certain about the return of the money talk less of gain. Also, in ponzi scheme u don't the person face to face which makes it worse. christian or not, ur are advised to flee from such. You're quite right, Victor! Have a blessed weekend! Christians flee from PONZI schemes; do the right things and God's favour and blessings will be yours.. May God see us through.. The economy is bad, yes, but there are better ways to survive than getting mired in scams and such like. Bless you, Amarachi! Thank you, Stanley. You are blessed! I pray that people listen. One of the schemes said theirs will last forever, lol! Not even this earth will last forever but you'll be surprised to find people believe that trash. "Remember, if anything seems too good to be true,it probably is". This quote summed it up for me. Nice one Ma, God bless you. Praise God! And God bless you too, Chinekwu! It's well. We keep learning everyday. The tragedy is when we refuse to learn from our mistakes. You're blessed, Patience! Funny indeed, ponzi scheme is gradually sneaking into the church. I can't explain the horrible thought that crept through my mind when, one day in church, I heard the priest telling us, or rather preaching about how genuine one of these online businesses was. Some Christians claim that economic situation is bad, and as such they have to supplement their earnings with other sources of income. But they forget what the bible said: in all these hardship, in all these tribulations, in all these pains, never lose your faith. Never compromise your faith in God because of mere secular things. we are the children of the kingdom, why then should we behave like wordly people? Wonderful admonition. Bless you, Chikwado! Very bad because he who eats sour grapes will surely have his teeth set on edge. I would have said, "Impossible," but these things are happening right before our eyes. May God deliver His people in Jesus' name. Undeniably true! I have been a victim of such schemes. Many of us students were involved in this scheme. We thought it a solution to this harsh economy not knowing that it came to collect the little we have and managing. With all their sweet promises, we were confused that ponzi is real and paying. But later we realise that our money is gone.and never to return.. Ponzi z a platform of robbing Peter to pay Paul.. Not a real business. A ponzi is a scam no matter what name it comes under. and as a child of God u should not participate in this no matter what because it works in a manner of robbing peter to pay paul. Ma, tanks for d enlightenment. My contribution is that this ponzi issue caused a lot of problems between even tight friends (some cases were handled at the security post in unn). This brings to mind what the bible says about the love of money being the root of all evil. But then, only from God comes genuine wealth which adds no sorrow with it and has no intention of robbing Peter to pay Paul. This has truly opened my eyes! I've never personally been involved in such a scheme but know a few people who did. And they lost it all! I suffered as a result simply because after one friend lost her money, she borrowed money from me to send her son to university. That was almost five years ago and I am still waiting to be repaid although the young man is now a qualified pilot! I can see the reason why many people are so upset after realising that they too were conned! May God grant us the ability to be satisfied and not greedy for wealth. Thanks for sharing. Thanks a lot, Joleisa! Many just take what the adverts say and jump in. It's sad but the media allow these things to be advertised like legitimate businesses. Even Telecom service providers do, thereby setting unsuspecting folks up to be duped. Glad you came by. You are sooo blessed! An informative article, thank you ma. Thank you ma for this wonderful piece...Many christians are victims of this ponzi schemes but i believe that God through this post will help. wow... aunty this is really an eye opener. some people are so desperate and never satisfied, they go to great lenghts to make money. even the risk involved is so much. And the losses uncountable. I read somewhere that Nigerians had deposited 700 billion with these Ponzi schemes. That is just an estimate. It could be more. We ve al sined nd fall short of d glory of God, tnk u ma for mkin us see d lite nd doin tins d rite way. more power to your elbow. Hard work and patience should be our watchword as Christians. We must labor to get our wealth because whatever we labor to get would be valued and will last longer, but those things we get easily without stress fades away quickly. Am really a victim to dis.... Each time I remember the money i lost in this schemes, I regret my actions. nice post, MA. Ponzi schemes.......people made money, people lost money. The truth is, a responsible Christian shouldn't be found on those schemes. They kill ur time, money and leave u with regret in d end. ponzi should really discouraged among Christians and others. Christians should not be greedy people. It's greed that makes people go into ponzi schemes. Never go for money you did not work for [except for gifts]. When you did not work for the money you have, the way you will spend it all will amaze you. At the end, you will likely have nothing to show for it. I realized that ponzi schemes, no matter how reliable they claim to be are scams and should be best avoided. Christians should not even be involved in such. Nice post ma! Why would the Evangelist curse the guy. As a child of God is he suppose to do ponzi. Ponzi is like gambling either you loose or you gain. It is a matter of luck. They will promise you to pay money and in return you get double of what you give. It is greediness and a child of God is not suppose to be greedy. People are desperate to get rich quick. The government should also do something to improve the economy of the country,provide jobs with maximum salary,reduce the price of petroleum products when all these are put in place the get rich quick syndrome can be tackled. As Christians, we need to be like Christ, act like him that is why we are called Christians. Before carrying out anything we should ask ourselves what will Christ do if he was in this position. So many people carry out this ponzi scheme for what they will get from it disregarding the act itself and its implications. Thanks ma for your good work of exposing this ills.